The PI-RF50TX Remote Controller - Control and operate the PV-500HDW Pro from up to 10 meters away. The controls follow Lawmate's known user experience - with the - Power/Wi-Fi/Record button - design. Easily operable by connecting the USB to the DVR. * Name and Parts from Quick Manual. 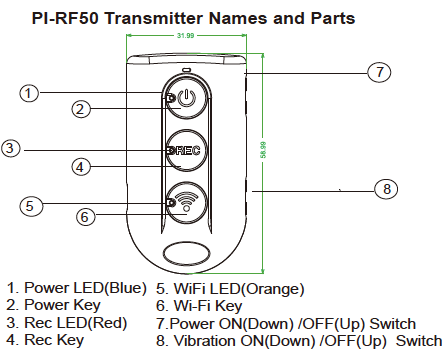 For more details regarding the functions of the remote controller, please consult the PDF file below.